You can choose from our sample books, have our design department create a customized look from scratch, or browse our collection of wedding invitations on-line at your convenience. If you have any questions about what to order, how to word your invitation, or any other matter, please feel free to contact us. Ordering is easy and you can preview your invitation with your own wording, ink color and lettering style. You can even request a sample invitation to help you decided which invitation is right for you. 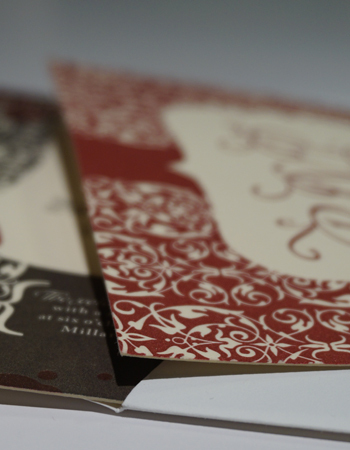 You can also come by Lowry's Printing to check out a bridal invitation book overnight.